Who Are the Two Canadians Detained in China? In this image made from a video taken March 28, 2018, North East Asia senior adviser Michael Kovrig speaks during an interview in Hong Kong. Two Canadian citizens were reported detained in China over recent days amid a dispute over Canada’s detention of a Chinese business executive wanted in the U.S. on bank fraud charges. One of the two men is a diplomat on hiatus working for an international think tank, the other is an entrepreneur and business consultant dealing with North Korea. A Toronto native and resident of Hong Kong, Kovrig had most recently worked as a senior adviser for northeast Asia at the International Crisis Group, a Brussels-based think tank on global affairs. A Chinese speaker, Kovrig went on leave without pay to take up his position nearly two years ago and no longer holds a diplomatic passport, along with the immunity that bestows. Before that, he worked as a Canadian diplomat in various portfolios, including in the consulate general in Hong Kong, where he helped arrange a visit by Prime Minister Dustin Trudeau in 2016. As first secretary and vice consul at the Canadian Embassy in Beijing from 2014 to 2016, Kovrig traveled around China conducting field research on politics and government policies and meeting with contacts, including political dissidents. Such work is common among diplomats and foreign journalists in China, but is viewed with deep suspicion by China’s ruling Communist Party, raising the possibility Kovrig could be charged with espionage. Kovrig, believed to be in his late 40s, was a frequent commentator on China affairs for the foreign media, including The Associated Press. Kovrig was very capable and a “very smart guy,” who was extremely knowledgeable about China, a former Canadian ambassador to China, David Mulroney, told the Toronto Star. Kovrig also worked for the United Nations Development Program after graduating from the University of Toronto and Columbia University. 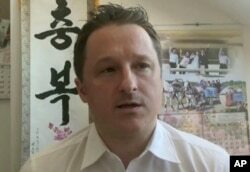 In this image made from video taken March 2, 2017, Michael Spavor, director of Paektu Cultural Exchange, talks during a Skype interview in Yangi, China. China-based Spavor is known for his contacts with high-ranking North Korean officials, including leader Kim Jong Un, with whom he has been photographed shaking hands and laughing. He was also key to bringing NBA player Dennis Rodman to North Korea in 2013 in what was considered a significant, if somewhat quirky, breakthrough in the outside world’s contact with the young head of the hard-line communist regime. The exchange is one of a small group of organizations promoting interactions with North Korea in a manner that has sometimes brought controversy for its unwillingness to criticize the regime’s human rights abuses. Its Facebook page advertises a five-day trip to North Korea over New Year’s, including a visit to the Demilitarized Zone and a hot springs resort. A fluent Korean speaker with 16 years of experience working and studying in East Asia, Spavor graduated from university in his hometown of Calgary and also studied North Korean affairs at South Korea’s Kangwon National University, according to his Facebook page.